Feeling a little blue this weekend - I took a 'Mom' moment and ran some errands, solo. I couldn't resist purchasing this bag... it just seemed to pick me up a little... from it I couldn't resist creating a card that picks up little bits of this inspiration. 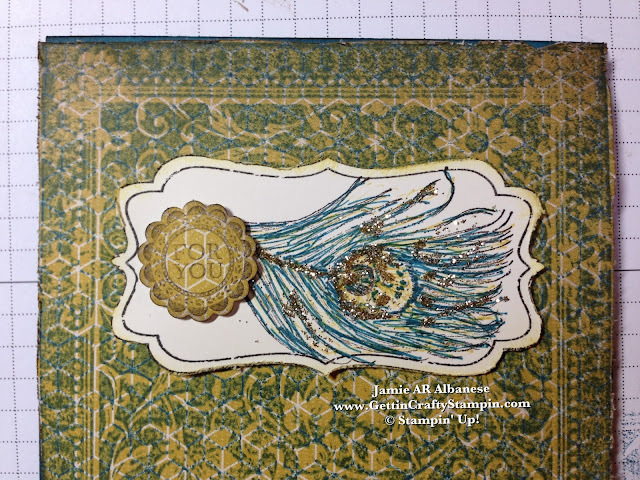 Going Vintage was the mood of my day... so this card came together with some fun twists. Please Leave me a comment on your thoughts! Pin, Facebook, Tweet, Instagram it... and Join Me with Following Me on those avenues (YouTube, Linked IN and more, too). Ex Libris is a beautiful vintage background stamp that reminds me of books and wall paper my grandparents would have had. Inking it in Island Indigo ink (#126986) on the Soho Subway Designer Series Paper (#130140). 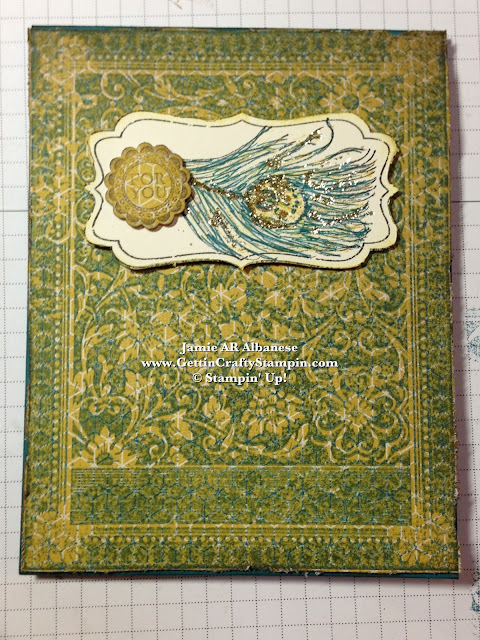 The Summer Starfruit patterned page allows shading and pattern under the pattern (kind of like stained glass). OK TELL ME... you wouldn't purchase this amazing bag? For only $.99.. so worth it! It makes me smile - just seeing all the colors, how vibrant they are! Stamping this, as you can see, the Soho Subway paper creates a new look, stamping the window with Early Espresso ink (#126974) and the Fine Feathers (#126517) stamp set on Very Vanilla card stock (#101650). 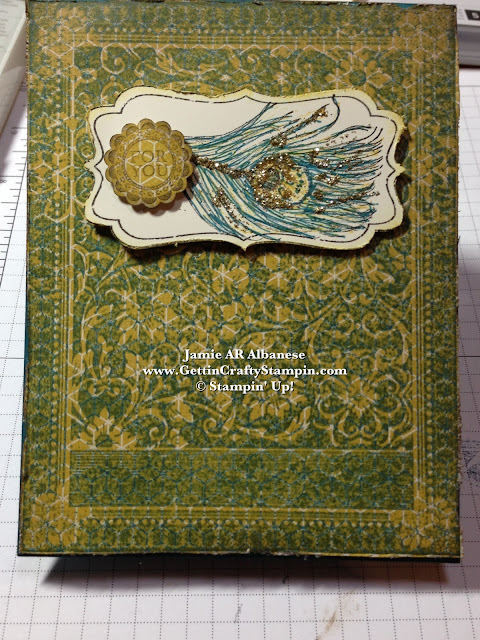 Colored the Peacock feather that was stamped with the Island Indigo and Summer Starfruit Stampin' Write Markers for dimensional color. This peacock looks lovely on it's own but I wanted a dash of gold. Our Multipurpose Liquid Tombo Glue (#110775) has a fine and thicker ends. 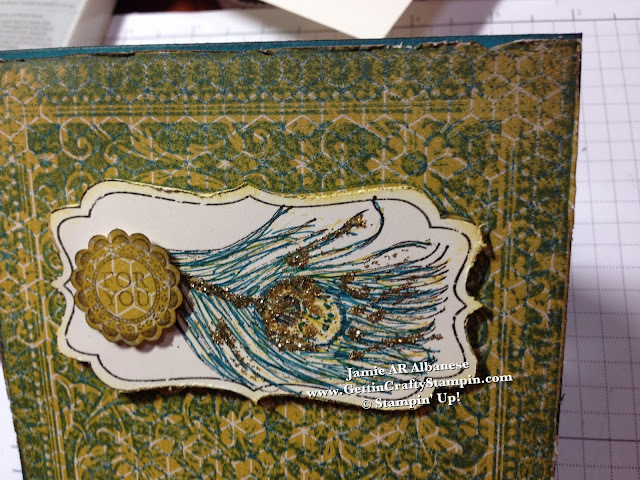 Using the fine end to highlight pieces with the Gold Stampin' Glitter (#132205 Holiday pg. 28) creates a fun dash of sparkle to this distressed and aged card. Island Indigo card stock (#122923) gets a softened, distressed edge with the Early Espresso ink (#126974) and Stamping Sponges (#101610). 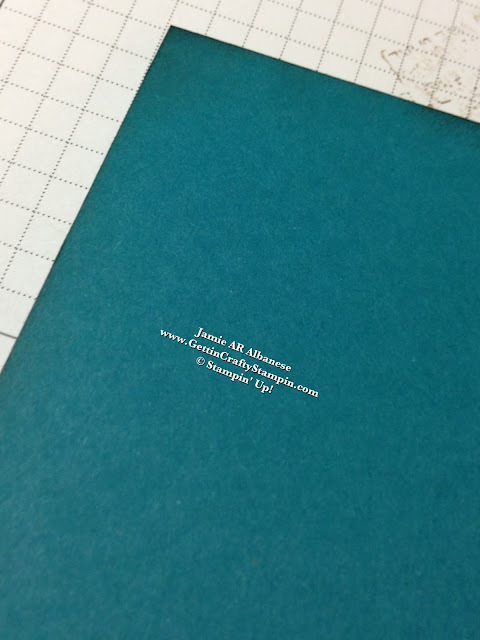 Cutting out the stamped image and distressing the edges with our Stampin' Distress Tool. Sponging the edges to add dimension. Layering the cut and distressed centerpiece (sponged the edges with the Summer Starfruit ink #126991). 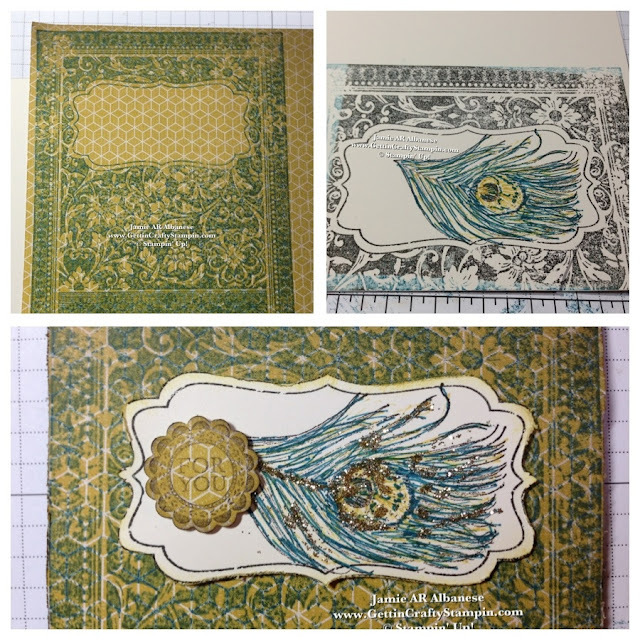 Adding additional dimension with our Stampin' Dimensionals (#104430) for a multi layered look. 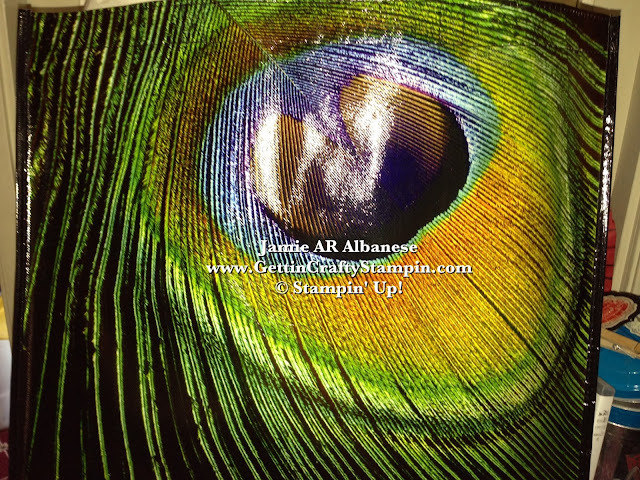 You can see the layering and the distressing, aging with the Stamping Sponges and Distressing tool. A Round Array stamp set (#129090) and the coordinating 7/8" Scallop Circle Punch (#129404) stamped with the Early Espresso ink on the Soho Subway Designer Series Paper for a coordinated look. Sponged edges, here, too create an additional distressed look. I just love how our stamps and coordinating punches make it easy to WOW! Multi patterns, distressed, sponged, aged, cool and vintage... I'm having fun with this look! It's amazing how a little "ME" time can refresh and restore me! Going from blue and cranky to a little more at peace, I think everyone needs that! This moment, bag and inspiration, and crafting did just that... restored a little bit of me to me! Crafting does just that! CLICK HERE to see how many of My Team say the same thing!! JOIN ME, My Team and/or My Classes and you, too, can be refreshed and restored!